... the LOTR Fan Club Mag, that is. Every couple of months this treasure would plop through my letter box - oh, the delicious excitement of wondering what little gems would be revealed this time!! And then, like all good things, it came to an end. Anyway, I thought I'd post a little snippet, for those who didn't have it. 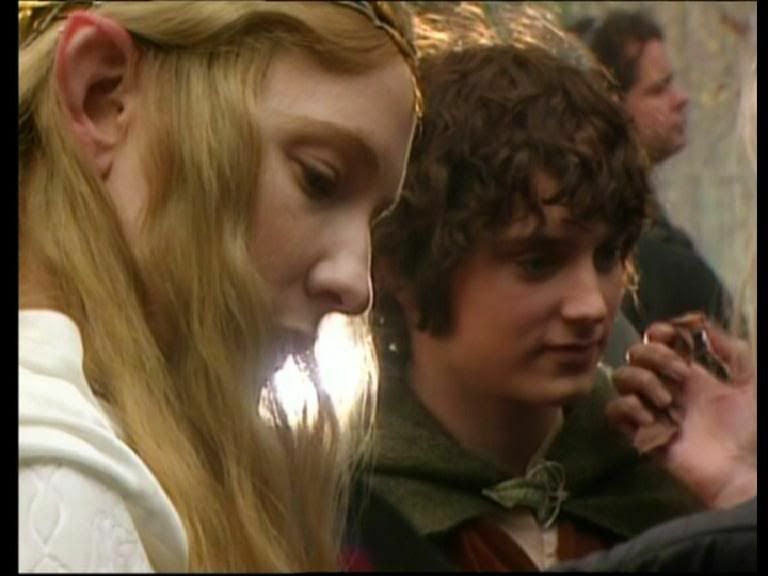 But first, I must mention something that suddenly occurred to me when I was watching the LOTR dvd appendices (again!). I remember reading somewhere that Stuart Townsend had taken part in the six weeks of training prior to filming - so when Costa Botes and others were filming the behind-the-scenes stuff, he would have appeared in a lot of it. So there must have been a load of footage we weren't able to see for that reason - unless they were somehow able to edit him out. Just wondering if anyone else had thought about that. So, that little snippet from the fan club mag with a few appropriate pics - I love how they used to race each other!! “So what exactly went into the process of turning Wood into a Hobbit? First, [Nancy] Hennah would slick Wood’s hair with a gel that when dry had a texture similar to concrete. Next, the Hobbit ears were glued on. “The ears are made out of foam latex” she says. 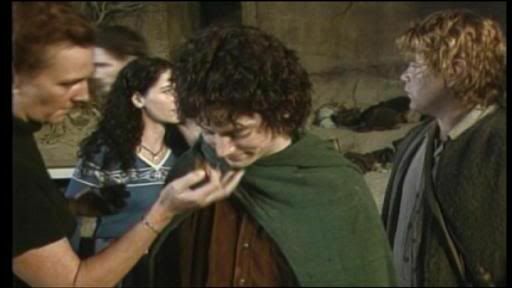 “ Every actor who played a Hobbit or an Elf had casts made of their ears at the beginning of the shoot. Prosthetics were then modelled off those casts creating a perfect fit for each individual actor” Once the ears were on, Hennah would blend them to match the skin tone and would apply the makeup. “Elijah didn’t need much – he’s got beautiful skin!” she admits. Time for a spot of brekkie!! 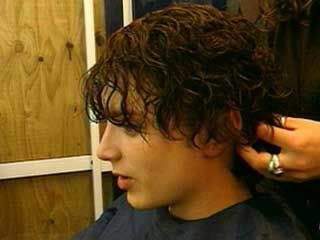 Lastly, the actor’s wig was put on, glued onto the forehead and then pinned in the back. The entire process “takes about an hour to do – 45 minutes if we are racing.” Hennah says. “Elijah and I used to race to beat Sean Astin. It always seemed that Sean got out of the chair before he did”. Wow, that final picture is... *stares* Thank you for sharing this! trianne once said that Elijah was a living work of art. This just proves it -- see, she's painting him! I loved Frodo so much, and nobody but Elijah could have brought him to life the way he did. She had the best damn job in the world. *sigh* Thanks for the memories, my dear. I have just sent you e-mail where I confess being so nostalgy today and afterwards I open your LJ page and...I am in tears. 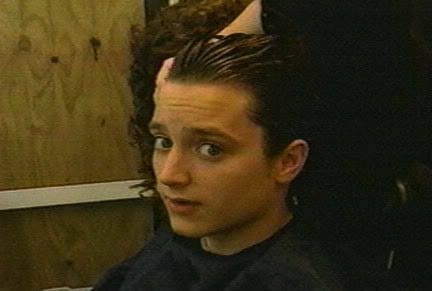 And above it, as I can see, your currently mood is the same....Oh, Pauli, isn´t he so perfect Frodo? Thank you for sharing your emotion I appreciate so much, I need it. Hi Allie! I seem to use the 'nostalgic' mood on my LJ more than any other just lately. But its exactly how I feel. I'll be posting a lot more 'memories' in the future. I regret so much not joining the fan club, but by the time I found out about it, the magazine was already about six issues in. I did consider it, but in a childish fit, decided if I couldn't have all the issues I wouldn't get any. I regret that now as well. I so envy you having this record of the trilogy and those people who made it the magical experience it was. If I'd joined the fan club just a tiny bit earlier, I could've had my name in the dvd credits!! I'll always regret that - and you may already know that Elijah and many other cast members were included in the fan club section of the credits as they all joined. Elijah was the very first member. I know that just after they finished issuing the fan club mag, it was possible to buy all the back issues from the fan club site - don't know if that still applies. 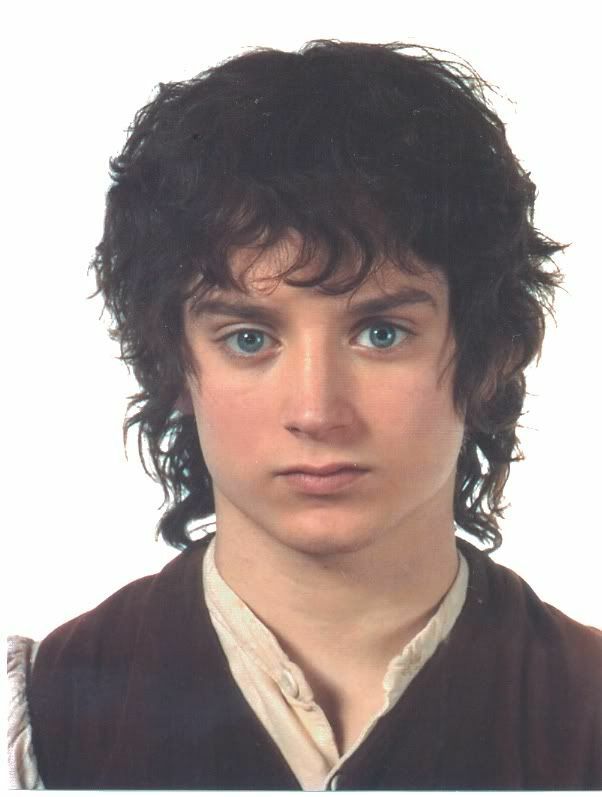 No one else could ever have played Frodo and brought him so vividly to life - Elijah was absolutely PERFECT! That last pic sums it up completely. I'm so glad that I was around to share in the whole LOTR phenomenon. We shall never see its like again. It has literally changed my life! NZ next month - paid for the holiday today! "We shall never see its like again. It has literally changed my life!" LOTR has changed my life too, in so many ways. I now tend to see my life as before and after LOTR!! And I find it hard to remember what 'before' was like. NZ next month!!! I'm so excited for you. As I get the DVD's last year I was lost - I will never get enough of the movies, the pictures, the commentaries and all the stuff around LOTR. I'm watching the movies, especially The Fellowship nearly every day - I can't help doing it and it's always amazing. And your pictures - thank you so much for sharing. "I will never get enough of the movies, the pictures, the commentaries and all the stuff around LOTR"
I came here via Shirebound's post. Thank you so much for sharing the article and photos. I came into the movie fandom a bit late and never joined the fan club, so this is a real treat to see. Oh, and that last photo is simply breathtaking! Was there ever anyone so perfect?